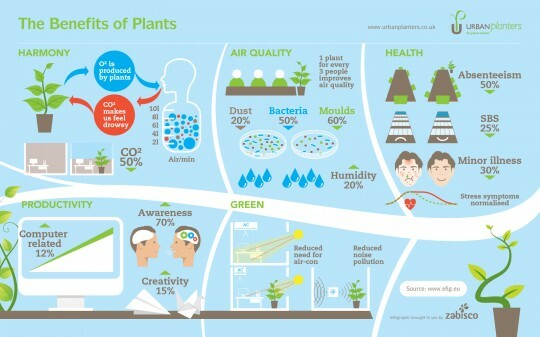 Live Plants provide numerous health benefits to building occupants, including improving indoor air quality by removing toxins and releasing oxygen. This combats Sick Building Syndrome, Increased oxygen levels in the workspace boost employee morale while increasing employee productivity through decreased absenteeism and greater efficiencies. Corporate America knows that having a professional plant service provides a good ROI through significant measurable through proven psychological and physiological benefits. Live plants also improve tenant occupancy rates, by offering guests and visitors a beautiful and pleasant environment that they will want to return to on a daily basis. Plants also soften hard lines while providing privacy between staff and departments. Increased property values are associated with a live plants service, while impressing clients and guests. No building is truly a Class A office space without live foliage to bring nature indoors.